So, you think I’m nuts for asking you to email us your holiday party planning tips in the middle of April, I know. 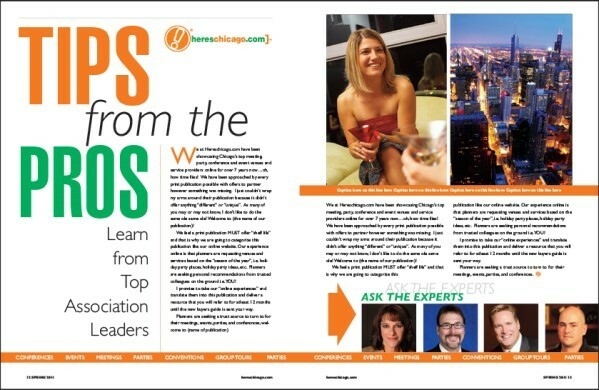 Well, we are working on a brand new Chicago Holiday Party Planning Print Guide which will be sent to over 3,000 meeting and event planners and also featured online at HeresChicago.com where our current listing members are receiving holiday party leads for the 2017 holiday party season. Our goal is to provide helpful ideas and venues for the upcoming holiday party season and I can think of no better resource than our Here’s Chicago community. Therefore, if you have any tips you’d like to share, please send them to Jason Paha, associate editor @ Jason@ptmgroups.com by next Friday, April 28. Why should you host a company holiday party this year? We’re also featuring the best venues to host a holiday party. If you’d like to feature your venue in this guide, here’s a link to more information.